that is generated by this method. If you use perform this experiment take note: this is NITRATE based emulsion! That means this film is extremely flammable, and possibly borderline explosive. It is safe to handle in general, but do NOT use near flame or extreme heat! A little humor in the warning: this Nitrate property was the method to assassinate Nazis in Inglorious Bastards! Before the Procedure, a little background on how I settled on this method and technique. In high school my teachers were always very supportive of my projects, and now that I was in chemistry my instructor asked if I wanted to try something chemical wise. I had just gotten into photography and wanted to put images on various things using Darkroom techniques. I did some research on the primary ingredients in standard Emulsion and found that the most common was a form of Silver Halide (either Chloride or Iodide). The use of Sodium Chloride (salt) was chosen because it is cheap, abundant, and it wouldn’t create something that would react with the Photographic chemicals in the end. This reaction, called a double displacement reaction, simple lets the two anions (Ag+ and Na+) exchange cations (-NO3 and -Cl) and the result is Silver Chloride. I could have used an iodide salt but it would require having some chemicals ordered as the only ones in the lab were “ill advised” by my instructor. The next step was to choose a medium for the solution that would be structurally sound when solid yet flexible, and easy to liquefy and apply to the material. At first I considered Wax as it melts easily and is pretty strong when cold as well it can seep into cloths and other materials with ease, but I decided that the drawbacks that I might encounter were too severe to look deeper into without options (I don’t, after all, have unlimited time with free chemicals in a high school lab every day!). I looked into a few alternatives such as Transparent Painter’s Medium (which turned out to be impractical as it is difficult to keep from going bad and an even consistency over a month at a time in the darkroom). I ended up just googling “DIY photo emulsion” to see if anyone has tried this before, and it so happens it has been done, and as it turns out the best medium is Knox’s Flavorless Gelatin. It melts easily, is relatively strong and flexible, is cheap, and maintains a decent transparency and is easy to store. So I made the emulsion and tried it on some paper and it worked, that’s it right? 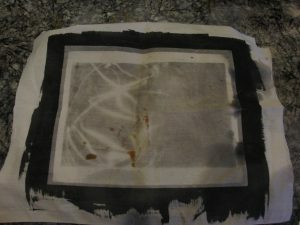 Not Exactly, there was the problem of the emulsion sticking to the paper without it ripping itself apart. However, I decided to put a little twist on things. I decided to not Coat Paper in the material, but Embed it in Canvas. 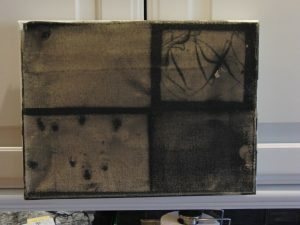 To do this I got some scrap cloth that was somewhat similar to canvas in weave, and I got some standard canvases. The key I found was to NOT use a canvas that has had Gesso Pre-Applied. This way it was actually embedded into the fibers when it was made, allowing my emulsion to stick on easier. More importantly, the canvas material does not rip apart when wet so it is MUCH easier to handle without ruining a day’s work. 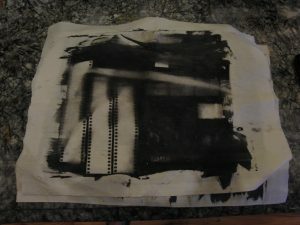 It originally took me about 15 minutes per sheet of paper once the emulsion was ready to apply due to the extreme handling precautions to keep it from shredding, and I couldn’t let it just sit where it was to dry as it would either stick to the surface or be exposed to light, and wax paper didn’t provide enough support to move it after applying. All of this on top of the fact that I cannot use any metal in the process while there is any wet emulsion as it would react. All of this then the paper would near tear apart whenever you held it or developed it. The canvas? Once I started using canvas material, I could put out several sheets in the same amount of time without issue. Even better, I realized that with the canvases if I coated the art side with emulsion, and then used Gesso on the inside (facing the wall if it were hung) then the material would not allow liquid to go all the way through the material from one side to the other but it would still allow a nice and deep embedding of emulsion. The advantage of this is simple: easy chemical processing and coating (assuming the coating doesn’t have to be smooth). I found that with this trick I could FLOAT my canvases upside-down in the chemical baths, which make handling safer, easier, and faster. The last concern is the surface of the emulsion. While the canvas had superior adhesion, it was a rough surface. So when I was applying emulsion, I floated it upside down in the emulsion, then while it was still warm I held it at an angle and then used a flat edge to smooth it out. I wasn’t going for perfect, but it worked out in the end. 5 grams Know flavorless gelatin. Heat the salt gelatin solution, with stirring, to 60 deg C, and under safe lights in the dark room, add the silver nitrate solution and continue stirring for five minutes. The mixture may now be placed inside the glass jar, inside the light tight container and refrigerated. It may later be applied by using a brush, a sharp edge, or flotation. Paper Drying: Once the paper has been coated, lay enough wax paper to cover the bottom of the paper safes, and place coated paper resin up, and allow to sit undisturbed for at least 24 hours. It is then ready to use. 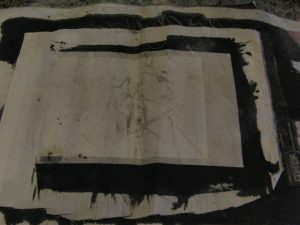 Develop Paper as normal, for canvas float upside-down in chemical tray. With the first batch of paper applied, I went ahead and tried to process it. Long story short: the paper would tear apart too easily. Once I got an understanding of my exposures with this emulsion, I started to get images in my tests using contact prints and the darkroom fluorescent lighting, and long exposures (around 2 min) under the enlarger. From left to right: The first contact print with a discernible image (and it’s actually a negative and therefore lighter than normal being a dark image, I used a positive to make the print). 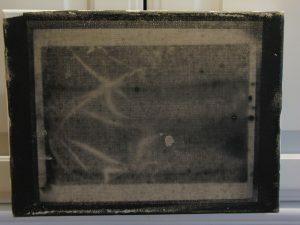 The second was made with a negative contact print. Still a little light but better. The brown stain is actually Color Print (RA-4) fixer. 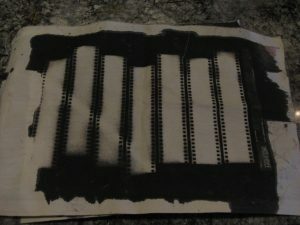 I am self taught in color processing, and I was doing some prints while in the darkroom and one of the test strips I was pulling out of the drum was supposed to be thrown out, but when flinging it to the trash some got onto the drying area for these prints. Not a big deal, just a nuisance. The time for canvas has come! – These two were sitting in a light box while I did all of the tests, and after some test strips using negatives and enlargers (not shown here) I figured my exposure around a minute and a half with my current negatives, and I also used a much more focused stream of light when compared to the original test pages, in which one simply raises the enlarger up to full height and exposes the paper. the enlarger was zoomed in on the canvas, ensuring a good enough light supply. The first two canvases are of a few images, kind of hard to see here as I refuse to go above ISO 200 on my camera and I never have good lighting when I need it. I like how it turned out in terms of it’s feel. Definitely a rough image, as this was before I figured out to use the Gesso-Free Canvases for better adhesion and using a blade for smoothing.